This article first appeared on East Niagara Post on January 13, 2015. It is repeated here as I work to put all my book reviews in one place. They will be posted on Thursdays or Fridays and only be altered from the original in that I will add publisher information and pages. Hopefully, by revisiting these reviews, other people might find a book they'd like to pick up for their own enjoyment. Real Santa by William Hazelgrove is the story of George Kronenfeldt, a divorced father with a new wife and family. His youngest child is nine years old and she is starting to question the validity of Santa Claus. He wants her to hold onto that childhood dream for as long as possible. As an engineer, he decided that he would give his daughter, Megan, a Christmas Eve visit from the jolly man in red. Intensive planning ensues, drafting the assistance of his elderly father who is also an engineer. All while this is going on, Mrs. Worthington, Megan’s fourth grade teacher has a personal mission after forty years of teaching of disabusing the notion of a mythological being delivering presents in the middle of the night. There is no room for such frivolity in her view. Unfortunately for Mrs. Worthington, Megan refuses to accept this. Between she and her father, they wreak havoc on her classroom. George has a lot of time to work out the logistics despite the fact that Christmas is only ten days away. He was fired from his job only the day before. It is at this point that he decides to give his daughter the perfect Christmas. When word gets back to his first wife and his two grown children, a demand for more money is immediately requested and his children question why he never did anything like that for them when they were young children. George take nearly $50,000 in equity from his home to make this dream come true. He designs the ramps needed to carry a sleigh, Santa, gifts and nine reindeer onto his roof. His roof needs to be reinforced to withstand the added two and a half tons. He has alterations done to his chimney to allow space for him the descend from the roof to the living room. Then, in order to give the illusion of flying to and from the house, he hires a special effects director to create it. The cost far exceeds his home equity and he cashes in a retirement account to pay for the $100,000 project. Meanwhile, Mrs. Worthington continues her mission to eradicate the fantasy of Santa Claus from her classroom. As a revolt to this program, Megan declares that her father promises that Santa will come to her house and that she will be able to video the event as proof. Mrs. Worthington is flabbergasted, and after an altercation with George, he is banned from the classroom and the holiday party. George’s wife, Mary, feels that George is having troubles after losing his job and that this project is his way of coping. She feels, unfortunately, that George is wasting the nest egg she and George had accumulated, and that he is becoming Santa to right some of the wrongs he did with his first family. She feels that he is ignoring her needs and vows to take Megan and leave him after the holiday. George rushes to put the final touches together, brushing off Mary’s reservations as simple seasonal stress. She would really leave him, he thinks. When he meets with his older children, he urges them to skip their annual trip to Florida for Christmas and instead come to his house to play along for Megan’s sake. He tries to make it up to them by including them in his project. Naturally, they refuse. Christmas Eve finally arrives. George has everything in order to have Santa arrive just for Megan. His house and neighborhood are turned into a temporary movie set. With a herd of incontinent reindeer and an overzealous special effects director, Santa lands atop the Kronenfeldt home. At this point chaos erupts. Mrs. Worthington attempts to shut the whole monstrosity down. The police arrive on site for a disturbance call. George gets stuck in the chimney, then nearly kills himself driving the team off the roof. All his efforts seem to collapse into shambles. Luckily, a mysterious guest arrives to save the day. 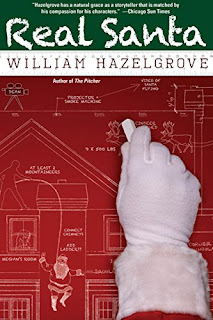 William Hazelgrove has written a novel that captures that spirit felt by parents as their children begin to reach the age when they no longer believe in magic. When kisses no longer fix bruises, or they no longer want a kiss before heading off to school, parents become desperate to grasp the fleeting wisps of childhood. Some of us would do almost anything to keep our children from growing up too fast. George Kronenfeldt personifies all of us who feel that way. With Real Santa, Hazelgrove has written a new Christmas classic. This ready-for-theatre novel can be enjoyed by everyone who reads this book. It is a fairly short book at only 236 pages, but he packs a lot of spirit into those pages. This book reminds us that Christmas is about more than simple gifts and maxing the credit cards. It’s about family and what we will do to hold onto them for one more minute. Craig Bacon does not get into the Christmas spirit until after his birthday. Today is his birthday. So bring it on, Santa!